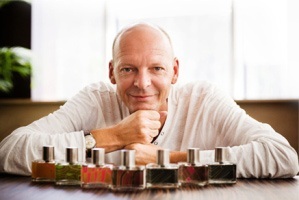 Mark Buxton was born in Derby, England, and says he "entered the world of perfumery by pure hazard".1 He attended perfumery school at Haarmann & Reimer and currently works for Symrise. In 2008, Mark Buxton launched his own line of perfumes under the brand name "By Mark Buxton". In 2012, the brand was renamed Mark Buxton Perfumes (see). See all articles at Now Smell This tagged Mark Buxton. Read an interview with Mark Buxton at Flair. 1. Via "Fragrance creativity: the perfumer--past, present and future" in Soap & Cosmetics, 2/1/2003.